Ruby Bell was a constant reminder of what could befall a woman whose shoe heels were too high. The people of Liberty Township wove her cautionary tales of the wages of sin and travel. They called her buck-crazy. Howling, half-naked mad. The fact that she had come back from New York City made this somewhat understandable to the town. She wore gray like rain clouds and wandered the red roads in bared feet. Calluses thick as boot leather. Hair caked with mud. Blackened nails as if she had scratched the slate of night. Her acres of kegs carrying her, arms swaying like a loose screen. Her eyes the ink of sky, just before the storm. From the opening of Ruby Cynthia Bond instantly submerges us into Liberty Township where Ruby Bell is very much the outsider in her own hometown. So much the outsider that she now lives in a ramshackle dwelling deep in the nearby woods. She has become ostracized and of course as readers we want to know why. Whilst most of the town laugh and jeer at her one man, Ephram Jennings, sees Ruby with different eyes and we soon learn he has been smitten with her since childhood. He too is seen somewhat as an outsider yet to a much lesser extent thanks to being somewhat shrouded by his sister Celia, who has followed in their Reverend father’s footsteps becoming quite the feared God fearing woman, who does not approve of Ruby at all. You might be thinking that this is therefore going to be some great love story set against the odds. In some ways it could be seen as that and yet, as Cynthia Bond soon shows us, there are many dark corners, secrets and layers of both Ruby the character and indeed Ruby the book. And as Ephram goes in the woods to give her White Lay Angel Cake as an offering of love and acceptance, after being scared in town and dropping her bread in her own urine, he discovers that there may be something else darker in the piney woods with Ruby, and not just her memories, though something just as sinister and something that has been following Ruby since childhood. That night, when the Dybou slid into Ruby’s bedroom, it stopped at the door. It seemed to grow larger. The air became electric. Spider cracks spread across the panes. Instead of reaching for Ruby, the Dybou lifted above her, the whole of the ceiling in shadow, then it dropped down upon the new spirit sleeping within her. In seconds the girl was gone, inside the creature, screaming, terror flashing in her clear eyes, small arms reaching for Ruby, as the Dybou slithered across the floor. If you are wondering what a Dybou is, and why would you not be, without giving too much away it is an evil spirit that feeds off other spirits and can take over the body of humans. Some might say it is the spirit entity of the devil. Yes, this is where Ruby takes on a rather strange turn as it becomes more and more magically surreal. Interestingly though I found it became all the more powerful and effecting for it. As we read on we both succumb to the world in which Ruby inhabits, learn why it has come to pass that she is so filled with these demons and spirits and why her childhood in Liberty Township and then her horrendous time in New York might have driven her to the depths of madness, if she is mad? If this had been written by many another writer I would have probably put this book down very quickly, with Cynthia Bond at the helm I was mesmerised both in horror and in hope for Ruby’s possible salvation by Ephram deep in those piney woods. The piney woods were full of sound. Trees cracking and falling to their death; the knell of axes echoing into green; the mewl of baby hawks waiting for Mama’s catch. Bull frogs and barn owls. The call of crows and the purring of doves. The screams of a Black man. The slowing of a heart. All captured, hushed and held under the colossal fur of pine and oak, magnolia, hickory and sweet gum. Needles and capillary branches interlaced to make an enormous net, so that whatever rose, never broke through to sky. The woods held stories too, and emotions of objects; a tear of sleeve, bits of hair, long-buried bones, lost buttons. But mostly, the piney woods hoarded sound. As we delve deeper into the stories from the piney woods and Ruby’s story you should be warned, there are some very dark and uncomfortable scenes ahead and some are not for the faint of heart of those easily upset. However, if you can read through them Ruby is an incredibly moving, magical and menacing read that you will feel like you have experienced long after the final page. Bond looks at sexual and domestic abuse, Satanism and the supernatural, interracial racism, legends and myths, sexuality, family secrets and love. All this based in reality, in fact some of the novel is based on Cynthia Bond’s own experiences, with an infusion of magical realism. I know; that is quite a heady concoction. Ruby is one of those books that will leave you as haunted as its characters. That is where its power lies. 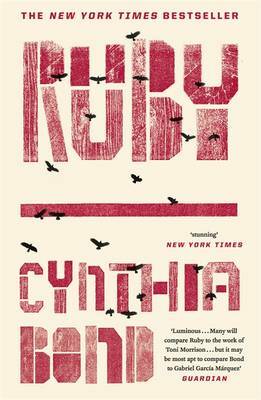 Ruby is one of the Bailey’s Women’s Prize longlisted novels that I am giving away here.